Wasn't expecting much from this place although I was told the food was really good, and it was,simple menu but cooked very well. The 3 beers on offer all came from the Robinson range which are not always my favourite but they were well kept. I went in here today with my business partner for a quick lunch. The menu was very good and reasonably priced. I had a duck pate and my business partner had breaded brie. The food was beautifully presented and delicious. The landlord knew we were on a quick lunch so kindly told us that the pies are made to order so would take a while, which we thought was very helpful. The house white wine was beautifully chilled . The whole place was very clean and when we asked the history of such an old place the landlord went to find us a book about it . Again very helpful. A good visit. We will return when we are working in the area. Popped in for a quick drink. Felt it could do with a slight tidying up. Also got the impression not many non locals come in on weekdays. However, much better than the nearby Griffin. Had one of the Robinsons Hartley's range which was surprising to find. 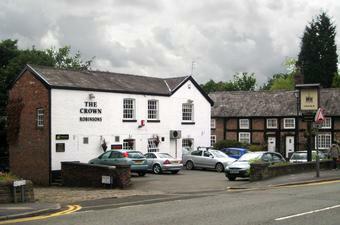 The Crown is a quaint looking pub, rather like a farmhouse, in a picturesque conservation area. Small car park at the front, small patio/smoking area at the side. The beer garden is over the road, which is not as strange as it sounds as the road in question (Vale Road) is narrow, cobbled, little used and appears to be part of the pub grounds anyway. Inside there are two rooms, one a small and cosy lounge and the other a larger dining room. The cosy lounge has typical olde English pub decor, copper top tables, beams and brasses, while the dining room, modernised in recent years, has a bare stone floor with solid wooden tables and benches. More beams and brasses. The pub gets busy at weekends, and the beer garden is very popular in good weather. On weekday evenings the small room is frequented by a handful of regulars; mostly besuited men who look like solicitors or accountants who have stopped of for a pint on their way home, while the larger room is usually empty. Sometimes in the larger room you will find groups of ladies chatting and sharing a bottle of wine. There are not many Robinsons pubs in the north part of Stockport. (I wish there were more).The beer in the Crown is typical Robbies - hit and miss. Sometimes excellent, sometimes avaerage, but I've never had a bad pint in there. I wish they'd bring their prices down though! No TV, pool table or loud music. Good. Overall a decent pub. Ridiculous, all the hype about their??? It was cold, fatty lamb, burnt yorkshires, on a roast, as for veg, a small bed of uncooked cabbage with 2 pieces of hard carrot and rock hard cauli next to it - NO not Al-denti! just raw - rubbish!! and ex[ensive for local pub- never again! !